DO YOU HAVE A "COMPLICATED" COMMERCIAL PROJECT? HAVE YOU HAD A BAD EXPERIENCE DEALING WITH A COOKIE-CUTTER TRASH CHUTE INSTALLATION COMPANY? With S&S National Waste, there are no long wait periods for ordering chutes. We fabricate our chutes in-house which means we can efficiently have your order ready to install quickly. With our experience and expertise, tricky angles or overhangs will never get in our way. We have the knowledge and equipment to customize your chute and meet your needs in record time. 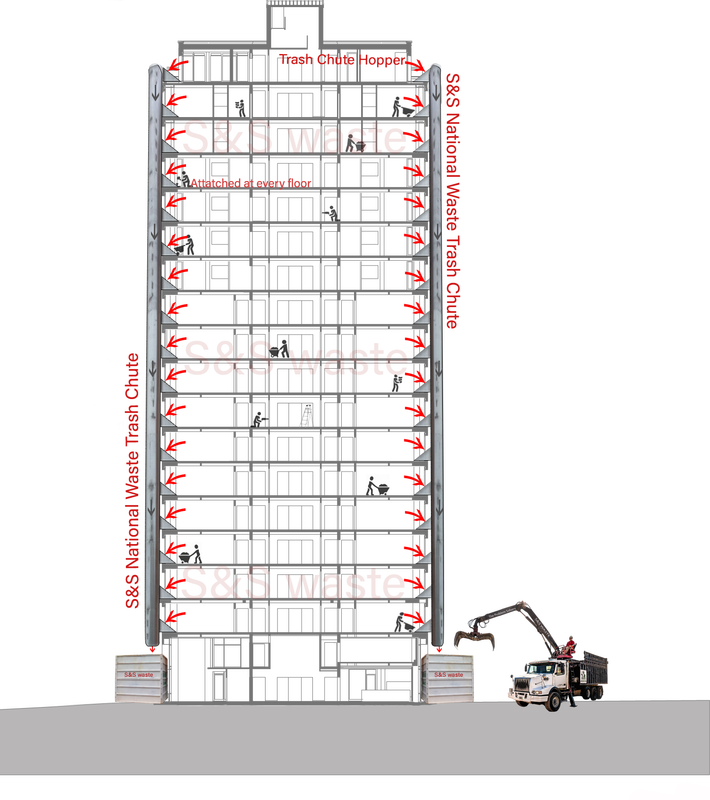 ​Our chute installation team has extensive experience measuring, installing and removing thousands of floors of chutes. And this experience affords us the ability to safely and quickly install and remove chutes - all of which will save you time and money. ​​Our standard trash chutes are 30″ round, 100% galvanized steel. When we install our chutes, they are bolted to the building at each floor level. Having this system makes our trash chutes the strongest and safest in the industry. Our trash chute will keep your job site safe while also eliminating most clogs and repairs. Our custom-made, high-quality trash chutes are built to save you time and money. and has installed over 50,000 floors of chutes "
​Safety is important to the team at S&S National Waste. And safety is the foundation of our trash chute system. The system is built to keep you and those working at your site safe. We create the safest work environment for sites using our trash chutes. Our large grapple containers are specifically designed to collect everything that comes out of the chute, providing the safest environment for your workers on the ground, as well. Our containers are usually 10’ high on the back end, but can be customized for your specific job site. Those high walls built at the rear of our trash containers assist in the elimination of trash build-up behind the container, and help construction debris from escaping the can. The grapple container never leaves its location while being serviced. This means that unlike roll-off containers which have to be removed and replaced, leaving time between for issues to occur, with the S&S Grapple System, you never have to worry about flying debris hurting anyone. Since S&S containers never move from the spot at the end of your chute during your project, your laborers can continue working, uninterrupted, as we clean the debris with our grapple system - never interrupting your work flow. Not only do we provide excellent service, we are a proud member of the United States Green Building Council. We are an approved LEED waste hauler committed to Recycling Construction Debris. We not only recognize the benefits to the environment, but also to our clients seeking LEED certification. We believe that it is our responsibility to protect the environment. We pride ourselves on always thinking Green.